This page describes the design for a baseline MSRP chat server supporting chat sessions between several SIP/MSRP endpoints, to be integrated with the OpenSER SIP Proxy. Additional users listed in a the resource-list attached to the INVITE are invited to the conference by letting the focus send a REFER to the end-points. This scenario aims to implement the same functionality while passing the responsibility of sending out the INVITE and management of the dialogs to the end-points, this allows the server to scale better while preserving the control of the conference, and most importantly an be implemented in OpenSER without the need of a complex B2BUA. are implemented in a slightly different way, by using ad-hoc conferences. Static conferences are created via special management interface (not part of SIP/MSRP). Ad-hoc conferences are created on-the-fly, when the first user joins a particular SIP URI. A static conference cannot be deleted by SIP/MSRP means. An ad-hoc conference is removed when the last participant exits. This module maintains a dialog with every subscriber, but it's a different dialog than the one started by INVITE. dialog info (From, To, Call-ID, CSeq) to supply it back to msrp-conference-focus when someone is needed to be kicked out. a=path:msrp://alicepc.example.com:7777/iau39soe2843z;tcp, to authentificate incoming msrp messages as belonging to this user. Other fields may be needed in the future, we could send the whole request (SIP+SDP) to msrp-conference-server unchanged, although msrp-conference-server will look only for fields it understands. msrp-conference-server responds with SIP-like request, which is merged into SIP header generated by openser. SDP part of server's response is sent as is without intervention of msrp-conference-focus. BYE and REFER from client are treated the same way. msrp-conference-server may [on behalf of authorized human] generate BYE using dialog info it has saved from INVITE. When the conference state changed in msrp-conference-server (user added/removed), msrp-conference-server [re]generates conference-info xml (format described in RFC 4575) and sends it [publishes] to presence-msrp-conference module. When openser is restarted, msrp-conference-server resends that info. 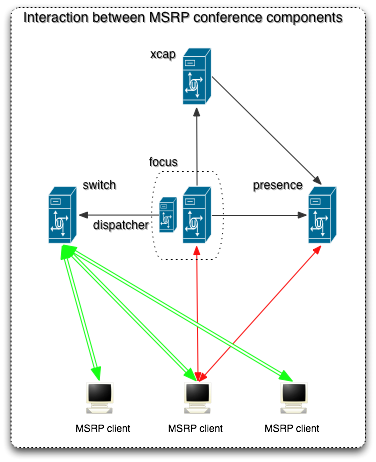 Authentification and Autorization is done by an upstream OpenSER Proxy server. Authorization related to conference functionality may be also performed by the msrp-conference-focus. The MSRP URI is considered a shared secret, so no additional auth is done on msrp connections. To decide who can SUBSCRIBE to the conference-info Event package, presence-msrp-conference checks XCAP/presence-rules for the given conference SIP URI. For newly created ad-hoc conferences, focus creates a new record in the xcap table (typically with allow-all policy). When the conference is destroyed, focus removes the record from the table. Alice is a client that implements SIP/MSRP. It has obtained by external means the SIP URI of a conference focus. To join a conference, Alice sends INVITE to Conference URI. Switch generates a response, supplying saved dialog state (From, To, Call-ID and CSeq) and SDP answer. Other SDP fields are not shown, but they're also provided by msrp-conference-server. SIP headers are shown fully, everything else is added by msrp-conference-focus itself. Focus generates a proper SIP response and sends it to Alice. From user perspective, creating an ad-hoc conference may be no different from simply joining an existing conference. However, INVITE that creates a conference may contain _resource-list_. Focus will examine _resource-list_ and send REFER to each user referenced. Following workflow is adapted from Section 6 of draft-ietf-sip-uri-list-conferencing-02. It's different though as instead of sending INVITE it sends REFER to referenced users. This is because in our design focus is just an openser module and not a fully fledged SIP endpoint, so sending INVITE would be difficult. Alice requests Focus to create a conference. In addition to the usual SDP offer she puts _resource-list_ in the request. Focus exchanges data with the server and then responds with "200 OK" just like in the previous example. When ACK is received from Alice, it is forwarded to server. server responds with list of REFERs focus needs to send. Since, in Alice's INVITE there's only one entry, only one REFER will be sent. When REFER is received by Bob's client, it should display an invitation where Bob can choose to accept the invitation. If he decides to join, his client will send INVITE to focus URI. For undisclosed reasons Bob decides to drop Alice from the conference. Since Bob is authorized as owner of the conference, he can use REFER with BYE method as described in section 5.11 of RFC 4579.
focus forwards the message to server, which changes alice's state to 'dropped' (won't accept messages from her anymore) and generates BYE using dialog-related info. msrp-conference-focus makes real SIP message from the one above (by adding other required fields) and sends it to alice. handling dialogs outside of openser - doable? Is _resource-list_ allowed in a non-creating INVITE? I think it should be, especially considering that user may not know if he creating an ad-hoc conference or joining an existing one.